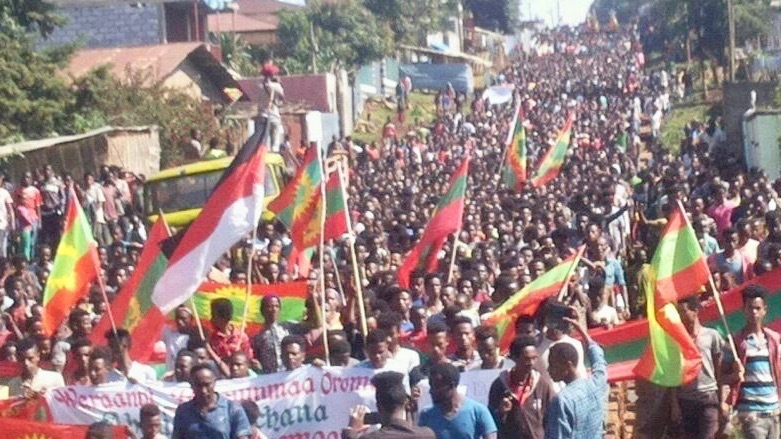 Large rallies supporting the Oromo Liberation Front (OLF) and rejecting rumored government plans to disband its armed wing have taken place across western Oromia. The situation, which has involved skirmishes and roadblocks, stems partly from uncertainty over an agreement the recently returned group made with the government. 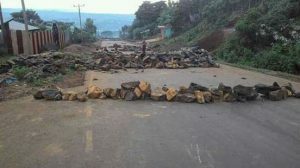 The protests initially occurred in around 15 towns, including Ambo, Nekemte and Dembi Dollo, on October 26 and 27. In Nekemte, East Wollega Zone, organizers demanded support for displaced Oromo and an end to alleged abuse of their community by the state broadcaster and Ethiopian Satellite Television, which is linked to Ginbot 7. Rallies continued today. “The reason for the rally is to protest against the government’s intention to disarm the Oromo Liberation Army (OLA) by deploying military forces to western Oromia,” said Abdisa Tolosa, who participated in Dembi Dollo, adding people are also concerned about those displaced from Somali and Benishangul-Gumuz regions, and the disappointing trajectory of political reforms. “Patience has limits. We will live with OLA and die with OLA. 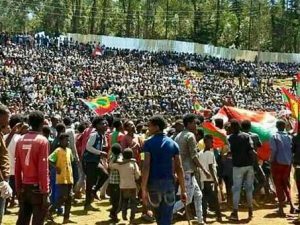 OLA is the shield of the Oromo people,” the crowd chanted at Shambu on Oct 30 in Horo Guduru Wollega Zone. Yesterday, Oromia president Lemma Megersa warned OLF supporters. Armed forces operating “in the name of OLF” must stop “terrorizing” people in western Oromia or the government will act to protect the rule of law and restore peace, he said at a press conference. OLA commanders claim they were not informed by OLF leaders of the agreement to demobilize, according to an insider. “They closed the roads due to rumors that the military was going to undertake massive forced disarmament,” he said, requesting anonymity. The OLF said yesterday that the military is killing civilians and should be withdrawn from communities in Guji Zone and western Oromia. OLF officials and commanders do not have a difference of opinion, but there has at times been a “communication barrier”, Kajela Mardasa, part of the OLF leadership in Ethiopia, said today by phone. People peacefully protested on Oct. 27 said Eebbisa Tottoba, Dembi Dollo spokesman. Youth blocked roads mid-afternoon the next day in an attempt to impede military trucks, and soldiers in the town then started shooting, he said Oct. 30. Grenades were thrown, slightly injuring four police officers. Shops and offices were closed, and the main road is still blocked, according to Eebbisa. Confrontations between OLA and security forces were reported in Gidami in Kellem Wollega Zone on Oct. 30 and in Begi and Maka Nadjo in West Wollega on Oct. 28. Other issues raised at the rallies were the situation in southern Tigray, where Oromo have allegedly been displaced, and a new national education roadmap that is said to not sufficiently promote the Oromo language. However, the major focus has been opposition to OLF persecution and ongoing confusion over the role of the liberation front. OLF had its terrorist designation removed by Parliament on July 5 after striking an agreement with Prime Minister Abiy Ahmed’s government to end its decades-long insurgency. Dawud Ibsa, the leader of the main OLF faction, gave a somewhat conflicting account in an Oct. 7 interview with Walta TV, suggesting the front’s forces would help maintain security. Some media reported this as announcing an intention not to participate in democratic politics, and then-junior government spokesman, Kassahun Gofe, said the next day that OLF would be disarmed if it didn’t do so voluntarily. Ibsa Nagao, an OLF Executive Committee member, claimed on Oct. 8 that this statement was due to a chain of misunderstandings. He said in an interview that OLF wants its fighters integrated into Oromia’s security apparatus, which is controlled by officials from Abiy’s Oromo Democratic Party (ODP), and that a committee is working on the issue. According to the insider, the disagreement is primarily due to a lack of transparency. “The agreement was very simple and clear: it was to disarm, demobilize and integrate into regional security. The confusion was created as it was not communicated in advance to field commanders and was not made public,” he said. It is inappropriate for the government to talk about disarming the OLA, as the sacrifices of the rebel army and the youthful activist network known as Qeerroo created the opportunity for political change, the OLF said on Oct. 26. Qeerroo and other campaigners sustained almost three years of protests that forced the ruling coalition to change tack and brought Abiy to power. The Prime Minister then accelerated reforms with a wide-ranging political amnesty and public criticism of previous authoritarian methods. In the last six weeks, OLF leaders, some of who arrived from Eritrea on Sep. 15, have been touring Oromia, where they were generally warmly welcomed. They also announced a plan on Sep. 10 to work with the Oromo Federalist Congress, which is led by Merera Gudina and Bekele Gerba, two popular recently released politicians. The electoral board said yesterday OLF has not registered as a political party. Ibsa said OLF’s relationship with the government is good and that they are trying to honor their agreement. In a possible sign of the future direction, on Oct. 13 an OLF commander who defected from Ethiopia’s army, Kemal Gelchu, was named Oromia’s head of security. However, some blamed OLF supporters for communal killings near Addis Ababa in mid-September, and on Sep. 28 prosecutors alleged a fatal grenade attack at a June 23 rally for the Prime Minister in the capital was carried out by suspects operating under the name of OLF. The next day, Addisu said the Sep. 26 assassination of Benishangul-Gumuz, Kamashi Zone officials in Oromia was also connected to the movement, adding the “OLF Army has to be disarmed and taken to camp”. It’s unclear how large the OLA is. Such allegations affirmed some Oromo fears that the events of 1991, when OLF was forced into exile, mainly by the Tigray People’s Liberation Front (TPLF), are repeating themselves. In recent weeks, there have been reports of heavy military deployment in western Oromia—although that may also be connected to recent fighting between Oromo and the Gumuz community in Kamashi and around disputed border areas. The trend of blaming OLF is also a continuation from the last two decades when legitimate opposition activity in Oromia was tagged as the work of the banned front, leading to thousands of prosecutions. The former insurgency formed in 1973 to fight for Oromo independence and was loosely allied with the TPLF in the struggle against the Derg. But during the post-1991 transitional government, the two liberation fronts fell out. Meanwhile, the TPLF had nurtured Abiy’s party to govern Oromia instead of the OLF. OLF-supporting activist Solomon Ungashe said on Oct. 30 that Oromia officials were being used by Ginbot 7, which opposes federalism based on ethnicity, and that the movement may be behind recent violence. Ephrem Madebo, head of Ginbot 7’s political affairs, said that OLF and other armed groups have to be disarmed and pursue a democratic struggle. “I support President Lemma’s press statement since the government is responsible for restoring peace,” he said by phone today. Further complicating the current picture is the role of OLF co-founder Leenco Lata, who returned in May with other leaders of the Oromo Democratic Front (ODF)—an OLF splinter group formed in 2013 that renounced armed struggle and pursues self-determination within a “genuinely” democratic multinational federation —to support the reform process. Abiy said in August that two or three Oromo parties would probably be enough to compete for office in the region of more than 35 million people. The shape of any alliances and mergers is far from clear yet, but ODF leaders are working closely with the Prime Minister’s Office. “The reform process will continue. The opposition is being provided a new legal framework and they should focus on organizing themselves and coming up with alternative policies. The current political contest is meaningless. There will be a national election in two years’ time. Let the Ethiopian people decide then who is fit to lead them to democracy and development,” said Lencho Bati, a leading ODF figure, who is a senior technical advisor to the Planning and Development Commission and sits on a privatization advisory board. After the reported Oct. 28 death of an OLF fighter, a protest was held Gimbi in West Wollega Zone on Oct 30, as well as in Jeldu in West Shoa Zone, Adola in Guji and Tullu Bollo in South West Shewa. There were demonstrations yesterday in Mugi in Kelem Wolega Zone, Gedo in West Shoa and Finicha’a in Horo Guduru Wollega, and today in towns including Limmu in East Wollega and Yaya Gulale in North Shoa. “Those who participate in such kind of a rally are supporting the enemies of the Oromo people,” Addisu said in his statement.